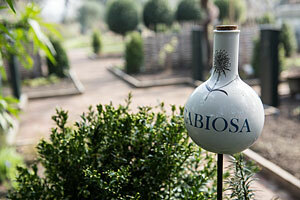 Following on from the developmental pilot at Luton Hoo Walled Garden, the 'Curse or Cure?' 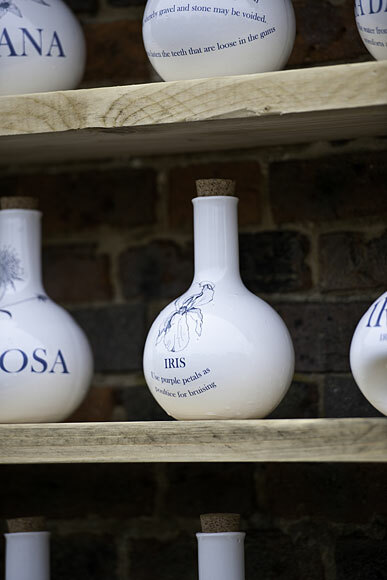 installation has now expanded and is being exhibited throughout the 2015 open season within the historic walls of Chelsea Physic Garden, the source of its inspiration. 'Curse or Cure?' 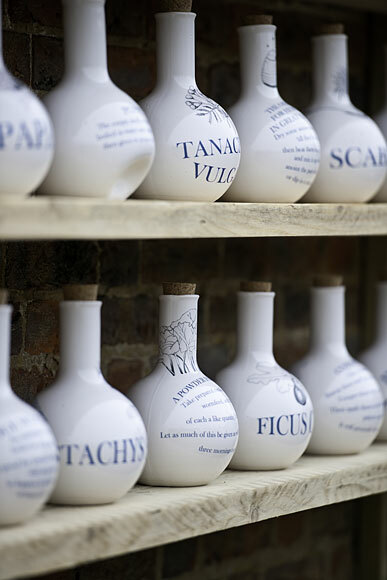 has developed into two parts: The first part is comprised of a trail of fifteen inscribed apothecary jars displayed on metal stakes amongst the plants. These lead to this second larger display; a wall installation of a further twenty-one illustrative jars. Both the trail and wall installation bring together the early chemists and the source of many of their medicines - plants. The 36 porcelain 'Curse or Cure?' jars illustrate the entwined practices of folkloric medicine and witchcraft, prominent in earlier times. 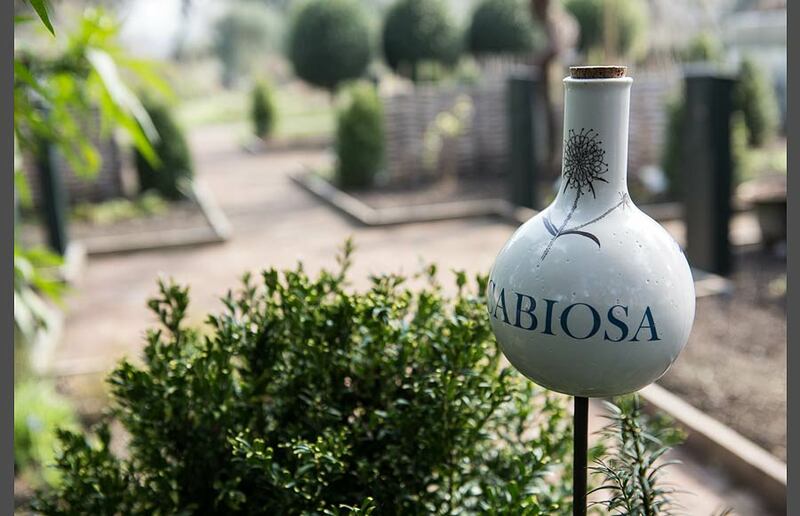 Set in the garden, the jars highlight the powerful use of plants. Nici has used a tin-glaze that references the jars used by early alchemists and herbalists. 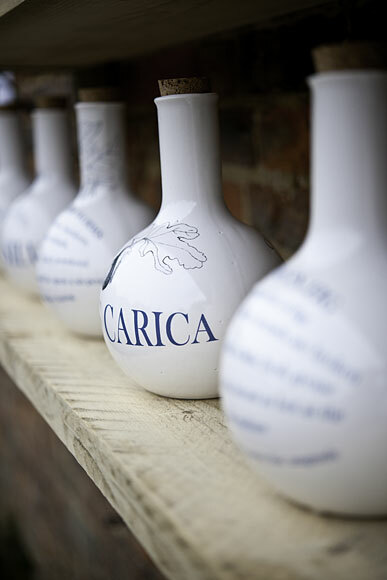 This type of glaze was also used for the 18th Century apothecary jars in the Victor Hoffbrand collection, housed at the Royal College of Physicians. Alongside Nici's own illustrative designs of plants used in medicine and alchemy, she has incorporated recipes for remedy, drawn from Culpeper's 17th Century Complete Herbal and Martha Bradley's The British Housewife (1756). At this time, practitioners in medicine and in sorcery were using plants according to the 'Doctrine of Signatures'. This suggested that "something about the plant resembles the symptoms of the disease". For example, a resemblance was made between the mottling of a diseased lung and the appearance of Pulmonaria (Lungwort). It was therefore used to treat the condition. 'Curse or Cure?' 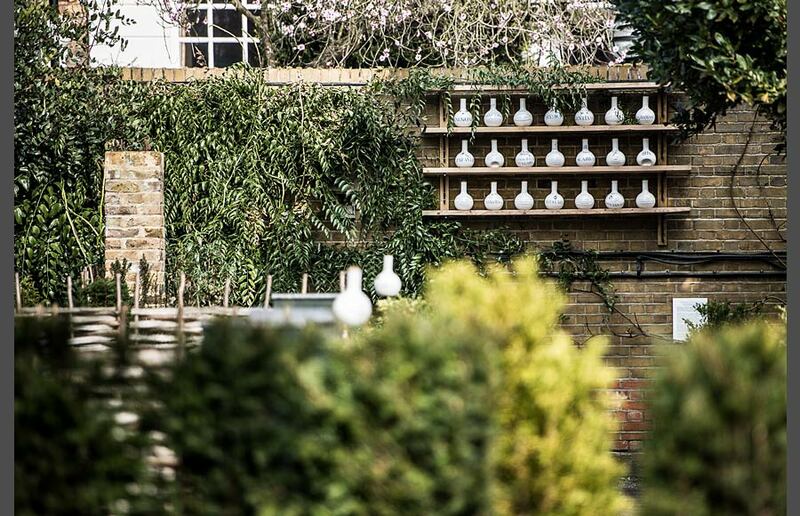 raises our awareness of these practices, whilst at the same time breathing life into the curative plants grown within this historic walled garden at Chelsea. 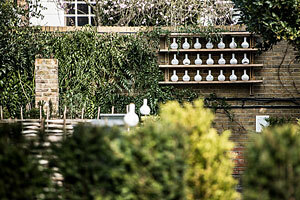 For further information, detailed recipes and photos of individual pots, please visit the mobile exhibition pages.